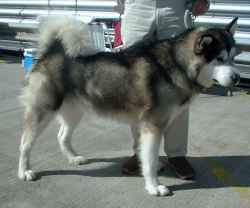 The Alaskan Malamute is a large northern dog breed originally developed for use as a sleddog. The Malamute is a descendant of dogs of the Mahlemiut tribe of upper western Alaska; native dogs were probably crossed with larger "white man's breeds" during the Gold Rush to increase their size for use as heavy freighting dogs. Their breed standard calls for a weight of 75 to 85 pounds (34-38.5 kg) and a height of 23 to 25 inches (58-63.5 cm) but much heavier individuals (120 to 140 pounds) are commonly seen.